It's time to celebrate my 2-year blogiversary (blog anniversary) with a fun giveaway! It's hard to believe I've been blogging for 2 years, the time has flown by! I appreciate each and every person who reads my blog or follows me in any way. Blogging would be no fun without people to share it with! So, thank you! So, what's up for grabs? Let's have a look-see! Prize #1 is Chanel Dragon! Dragon was my first Chanel and I love it so much. It's such a perfect red creme! 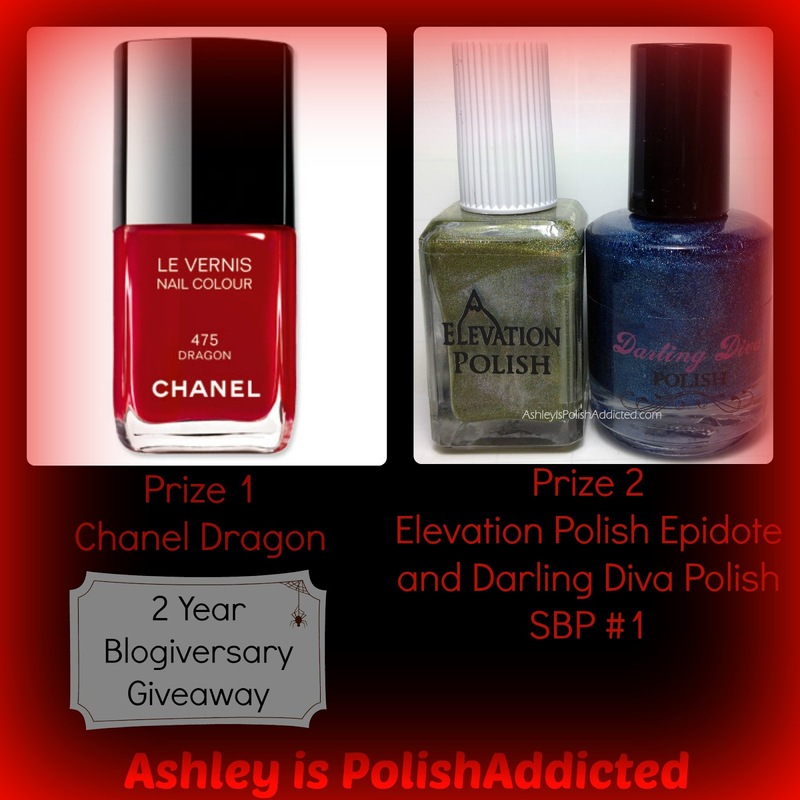 Prize #2 is one bottle of Elevation Polish Epidote, a gorgeous olive green holo, and Darling Diva Polish Small Batch #1. I posted the Darling Diva Polish here; it was limited to 20 bottles and is no longer available for purchase. All prizes are brand new, never used. International entries are welcome! Please use hashtag #ashpolishaddictgiveaway when sharing on Instagram! Congratulation for blog anniversary! :) Thank you for the giveaway! Congrats and thank you for the giveaway! Unfortunately I can't figure out how to share the picture on Instagram? A little help would be appreciated. Hi Debbie! You can save the photo to your phone (either from my post here, from my Facebook page or by taking a screenshot of it on Instagram ) and just post on your IG account. Make sure to use the hashtag and/or tag me so I can see it. If you need anything else just let me know! Thank you for following and good luck! where is your bloglovin' link, please? Congratulations :) 2 years is big!